We’ve posted on Goodby Silverstein & Partners a lot lately – especially for do-good work like the Hacking Autism project. Now they’re out with work for another good cause: American Rivers. Each year, billions of gallons of rain runs off water-impervious surfaces such as concrete, metal, and asphalt, mixing with waste, causing health threats, beach closures, habitat degradation and swimming and fishing advisories. To help combat this, American Rivers, has created green rooftops that can trap and filter storm water rather than allowing it to run into sewers. 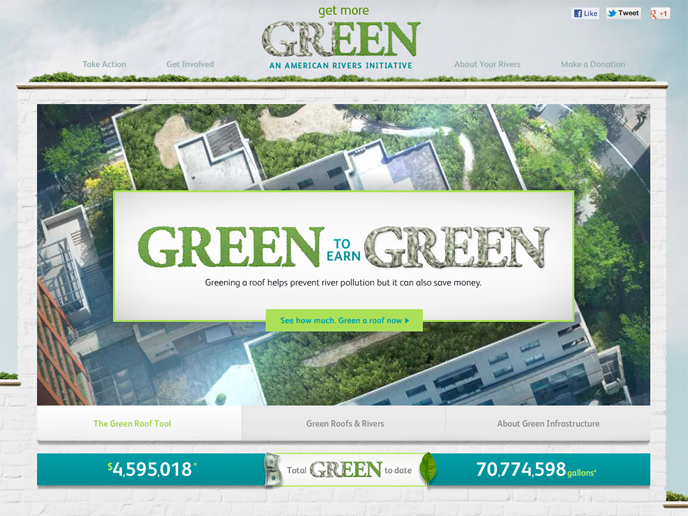 As part of the initiative, GSP has created online tools that help show companies how they can “green” their roof, as well as the environmental and economic savings that will result. In addition, GSP created a “seed slingshot bookmarklet” that users can use to “green” any web page on the internet and see the amount of savings that can come from going green. There are also online banners, Facebook and Twitter pages, video and print ads driving people to the online tool.